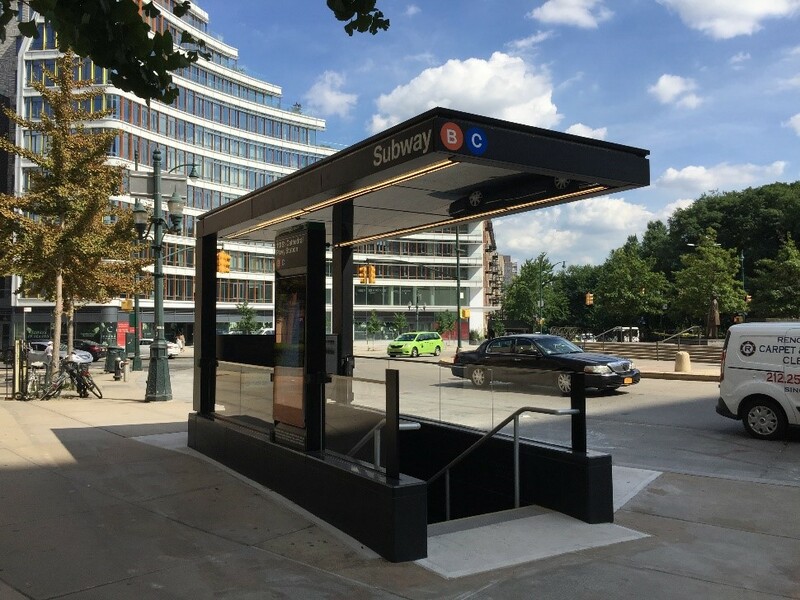 The Central Park West/86th Street B, C subway station reopened last week after five months of renovations and upgrades as part New York City Transit’s Enhanced Station Initiative. The project was completed by a design/ build team which included LHP Architects as well as ECCO III and Hardesty & Hanover. The station underwent significant repair work including improvements to structural steel and concrete; stairway upgrades, new railings and guardrails; cleaned and repaired tilework and concrete floors, and replacement of platform edges. New technical features such as digital wayfinding and customer information screens; countdown clocks, USB charging stations, and security cameras were added. The West 72nd Street Station of the B/C line reopened this week after a five-month period of restoration and modernization. The project completed by LHP Architects as part of a design/ build team which included ECCO III and Hardesty & Hanover. 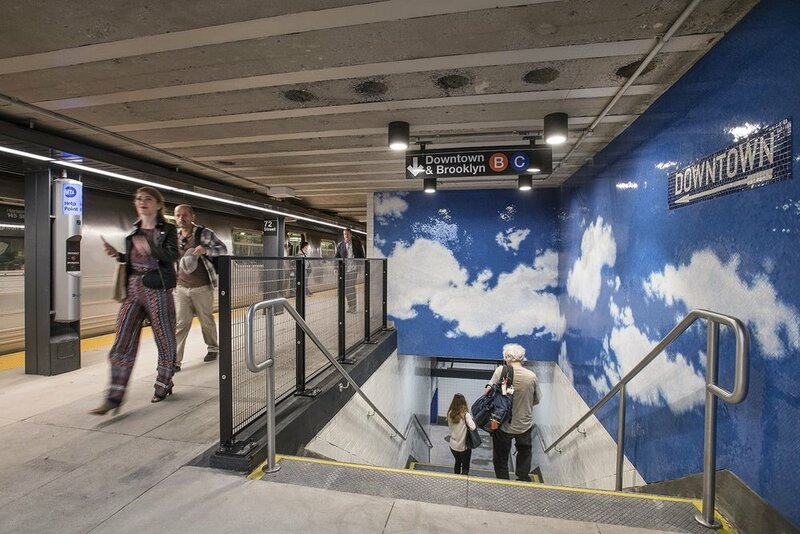 The newly renovated station features new digital information displays, energy-efficient lighting, better wayfinding and upgraded security equipment as well as a mosaic art installation by Yoko Ono, called SKY. The scope of work involved repairs to the station structure, replacement of floor slabs and steel columns as well as enhanced waterproofing. The completed station is brighter, cleaner and easier to navigate. LHPA is proud to announce the completion of 110 Street/ Cathedral Parkway Station, the first subway station in Manhattan to be upgraded under New York City Transit’s Enhanced Station Initiative (ESI). As part of a design/build team which includes ECCO III Enterprises and Hardesty & Hanover, LHPA is designing the upgrades to four NYC subway stations on the Eighth Avenue Line (W. 72nd Street, W. 86th Street, W. 163rd Street/ Amsterdam Avenue and Cathedral Parkway/W. 110th Street.) The 110 St. Station, which had been closed since April, reopened on September 2 and service at the station is back to normal. The Enhanced Station Initiative is a rehabilitation program with the objective of transforming existing stations into modern and sophisticated transit facilities that are safe, intuitive and user friendly. The objectives of the projects are to improve the reliability, access and customer experience inside the subway system. As part of the initiative, repairs were made to the station’s structural steel, concrete on platforms, and waterproofing. A series of station enhancements, such as new railings, replaced platform edges and stair treads; new tiling, a new turnstile area, brighter lighting, new customer dashboards, and digital signage was also added. LHPA has a long history of working with the NYC Transit Authority, having completed numerous station up-grades including award-winning projects at E. 180th Street in the Bronx and Bleecker Street in Manhattan. 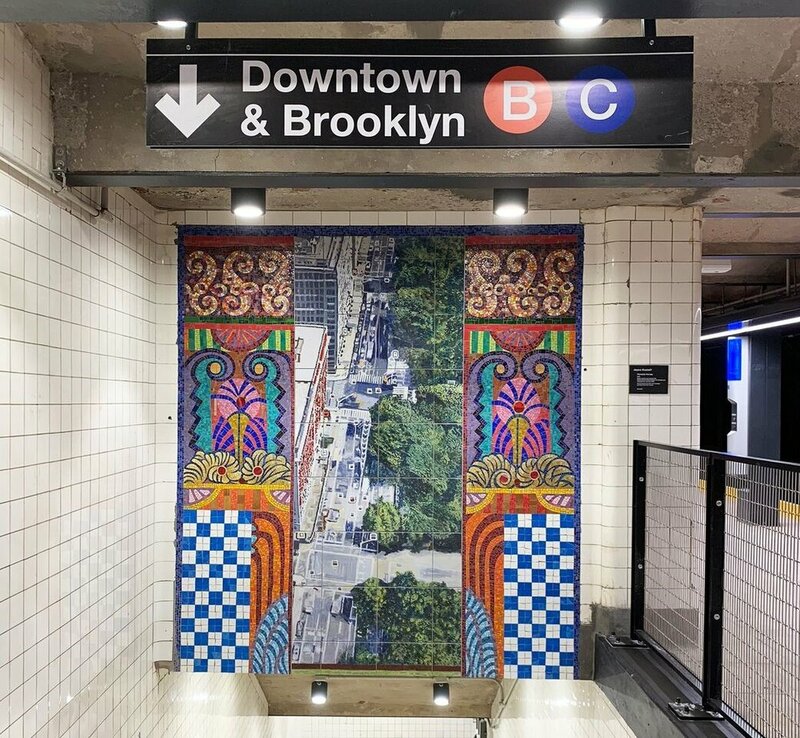 Our work has involved preservation of historically significant finishes, collaborations with artists engaged in the NYCT’s Arts for Transit program, and technical issues such as ADA access and improved circulation. Editor’s Note: This story was originally published on August 29, and has been updated with the most recent information available. Good news: The Upper West Side’s Cathedral Parkway-110th Street subway station for the B and C lines has reopened and service at the station is back to normal. Back in February, the MTA announced plans to shutter three Upper West Side subway stations and one Washington Heights station to conduct repairs as part of the MTA’s Enhanced Station Initiative. The agency opted to close the stations completely to allow for the repairs to be carried out quicker and safer. The 110th Street station closed on April 9 and crews repaired the station’s structural steel, repaired concrete on platforms, and performed waterproofing. A series of station enhancements, such as new railings, replaced platform edges and stair treads; new tiling, a new turnstile area, brighter lighting, a new customer dashboard, and digital signage was also added. The revamped station made its debut on Sunday, September 2 and service in both directions returned at 5 a.m. on Tuesday, September 4. In a press release, the agency touted that the subway station managed to reopen “on time and on budget,” both things to celebrate when it comes to the beleaguered subway system. “We’re thrilled to be returning this station to the community in better condition than it’s been in for decades, with critical structural repairs performed and brand new features that will make planning and taking trips with us easier and more convenient than ever,” said New York City Transit President Andy Byford in a statement, who was also present at the reopening of the station. A rendering of what the new entrance is expected to look like. The subway station at 110th Street and Frederick Douglass Boulevard, which has been closed for upgrades since April, will reopen over Labor Day weekend — “on time and on budget” according to the MTA, which does not get to use that phrase very often these days. The B-C station got structural repairs and new technological features meant to make the station safer and more inviting. The MTA was criticized for adding elements like LED lighting and touch-screens to stations without putting in more practical enhancements like elevators for disabled people or otherwise improving the slow service that has plagued the subways. The press release about the reopening highlights the structural upgrades to the station in particular. The renovation also extended a glass mosaic that was in the station. Two other stations — at 86th and 72nd — remain closed for upgrades. In the meantime, a bus has been making stops outside the stations, but its schedule isn’t posted and the MTA won’t even acknowledge it exists.